Here’s a fun deal for all you MasterCard holders out there! 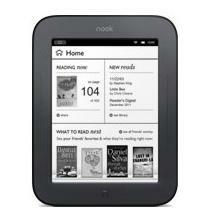 You can grab a NOOK for $99 and get a Free $25 Barnes and Noble eGift Card. If you like math, this means you’re paying $74, which is a great deal on a NOOK. Just to give you a frame of reference, the Special Offers Kindle (meaning it has ads to make it cheaper) is $79 on Amazon right now. The Barnes and Noble NOOK deal lasts until 2:59 am EST 2/8. Remember, you must pay with a MasterCard.